Fiesta Amigos 2013 | ¡VidaMaz! State Secretary of Tourism Francisco Córdova, Greg and Dianne from VidaMaz, Governor Malova, Mayor Higuera, and El Cid’s Carlos Berdegue. 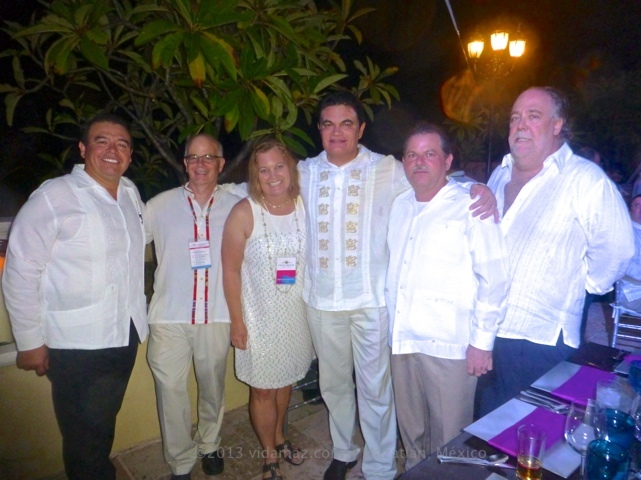 As always, the annual tourist industry event—La Gran Fiesta Amigos de Mazatlán—has been a spectacular success. A bit warm and humid outdoors last night for this time of year, but those attending from throughout Mexico, Canada and the States didn’t mind it one bit. The event this year was 70% smaller than it was last year, primarily because they are gearing up for the big 20th anniversary next year. We actually really liked the smaller size—much easier to get to know people, and I imagine it’s more realistic to cook gourmet food for a smaller group (about 250, I’d guess). The Fiesta Amigos 2013 opening cocktail reception was Monday evening at the Luna Palace. I have never before attended a special event there. The place was beautifully decorated and very welcoming, and the service was impeccable. Photos below; click on one to enlarge or view a slideshow. Great way to display skewers! Tour operators, travel agents, airline officials, hotel and hospitality officials spent all day Tuesday at our gorgeous convention center in meetings. Then, last night was the gala dinner at Pueblo Bonito Emerald Bay. We had cocktails on the lawn while a sax players serenaded us. After brief comments by the governor, we went up some stairs to dine on the rooftop overlooking the ocean. The decorations were stunning, and the food was unbelievably good. I think I could eat that soup (squash blossom and mussel) every day for a month! Photos below; click on one to enlarge or view a slideshow. I absolutely loved the table colors! And the flowers were to die for. The music was soooo lovely! The highlight of the event is the presentation of the “Golden Deer” Awards. This year’s winners included Delta Airlines, Sun Country Airlines, Expedia, Best Day (Mexican online travel agent), our new friends Estur (national tour operators)—for the third consecutive year. A new award this year was for convention organizers, and the inaugural award in that category went to Mark Rogers. The major award, “Amigo de Mazatlán,” was given to Don Guillermo Bernal Valdez, for his over 40 years of intense promotion of our port. Due to health issues Don Guillermo could not be present; the award was accepted by his three children. Photos below; click on one to enlarge or view a slideshow. Governor Malova and Mayor Higuera attended last night’s gala. Giving out the awards were Carlos Berdeque Sacristán and Gaspar Pruneda, Vice-Presidents of the Hotel and Tourist Business Association; Francisco Córdova Celaya, State Secretary of Tourism; and Sergio Rómero, standing in for Mayor Higuera who had departed with the governor before the awards were given. There was a whole lot of excitement in the air, and lots of talk about the new highway to Durango and the Puente Baluarte. Huge kudos to the Mazatlán Hotel Association, Pueblo Bonito Emerald Bay, Luna Palace, and the Convention Center for such a huge success! ← Feliz Día del Mesero! A Waiters’ Race Like No Other! Wonderful coverage, as usual, of this important annual event! Were Special Recognitions awarded? Say, to Vida MaZ for example? You certainly deserve it! A big hug! Thank you, Isa. 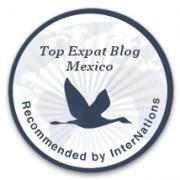 We were honored to receive an award last year–we keep the photo at the right here on the blog 😉 This year it was a pleasure just to enjoy talking to all our visitors and supporters of MZT, domestic and international.